How do you deal with pressure from your mates to gamble? Picture you and your mates from the cricket or footy team celebrating a win at the local pub or club and during the night someone suggests that everyone puts in $10, $20 or even $50 into the pokies. Maybe you don’t want to play, but you really feel the pressure to do so. 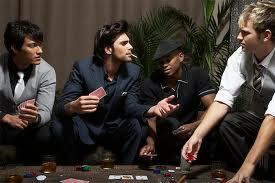 It’s not really about gambling, but about being part of the team – about being included – this is peer group pressure. Maybe it’s not so much of an issue if you can afford it, and it stops at a small amount. But how do you deal with it if this leads to you gambling more with your mates or on your own? Soon you could be gambling more than you can afford to lose. One strategy you could use is to let your mates know that you have an issue with gambling or that you can’t afford to lose the money. It might be really hard to say it at the start, but trust me, often the best support you can get in changing a behaviour that you want to change is from your mates – because, well they’re your mates and that’s what mates do they help each other out. Anyone got other ideas that work?? – post them! There is another picture that is worth looking at…You and a mate are at the pub or club and your mate really puts the pressure on to kick into play the pokies. Maybe you don’t want to play but your mate gets peeved. There may be a few wins, you may be up, but your mate won’t let you pull out – because he reckons the big win is coming!. This keeps going until it’s all gone, and this happens time after time. Is this peer pressure or are you just being manipulated into supporting someone else’s gambling habit. What do you think?